If I randomly picked an English city where I’d expected to find a vibrant coffee scene with one of the country’s top coffee shops, it wouldn’t be Norwich. Perhaps this is just a result of my ignorance, but tucked away in East Anglia, down the narrow streets of Norwich’s historic city centre, something very special is going on, and Strangers Coffee House is at the heart of it. With a south-facing aspect on the broad Pottergate, the late summer sunshine was showing Strangers off to the best possible effect. However, no matter how visually pleasing it is, the real draw is the coffee, with an exclusive house-blend roasted by nearby Butterworth & Son plus two guests, one from Butterworth & Son and the other from London’s Caravan. These are rotated on a regular basis: for example, when this is published, Union Hand-roasted will be supplying the two guests, using same bean, but with the green beans prepared using two different processes, which should make for an interesting comparison. Add to that three pour-over options (also regularly-rotated), plus loose-leaf tea (Butterworth & Son again) and decent selections of sandwiches and cake and you’re in for a treat. September 2015: I’m delighted that Strangers Coffee House won this year’s Lunch Business Awards Best Coffee Experience. Congratulations! Strangers is on the semi-pedestrianised Pottergate, opposite the wonderfully-named Lower Goat Lane. A couple of generous windows face the street, with a recessed door on the right. Stepping inside, it’s soon clear that this a very special space, particularly when the sun streams through the windows, bathing the interior in a warm, welcoming light. This plays well with the natural woods of the floor and furniture, while the whitewashed walls and ceiling contrast to the black paint of the exterior. The counter’s against the left-hand wall, opposite the door. The temptation to pack the interior has been resisted, with just five tables sharing the space. There’s one to your left, occupying the prime spot in the window, while another is to your right, tucked into a sunny spot by the door. The third’s in the centre of the room, the fourth against the right-hand wall. At the back, by the espresso machine, is the fifth and final table. This is the biggest, with a small bench and two chairs. You might get 15 people inside, although there are another three tables outside on the opposite (shady) side of the street. That Strangers is a speciality coffee shop of the highest order is pretty obvious. The bright red two-group Sanremo is hemmed in by no fewer than four grinders (house-blend, two guests, decaf). You might think that this would create a barrier between customer and barista, but such is the way that head-barista/owner Alex and his colleagues reach out that any barrier, real or perceived, is quickly broken down. Caught peering at the labels inside the hoppers to see what was on offer, Alex quickly engaged me. 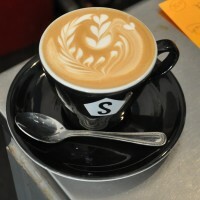 Although Caravan’s natural-processed single-origin Kenyan was tempting, Alex recommended Butterworth & Son’s Yirgacheffe, another natural-processed single-origin, suggesting a split shot (espresso and single-shot cappuccino). I returned to my table and my coffee, plus glass of water, soon arrived. In milk I found it very smooth, but it was a little lost in my cappuccino. I suspect a piccolo would have suited it better. The milk was beautifully steamed, the pattern holding to the bottom of the cup. While I wouldn’t have said it was anything out-of-the-ordinary, as a straight-up espresso, it really came into its own. I’ve not tasted anything quite like it: the best description I can manage is really light and zingy, a sweet, complex coffee. Quite superb. In the interests of research, I also had a pour-over. There was an Ethiopian Dumerso and filter-blend on offer. However, Alex’s colleague, Will, recommended Caravan’s Kenyan Muwa AA through the Clever Dripper (Chemex or Aeropress were the other choices). Unfortunately, with a train to catch, I rushed my coffee, not fully appreciated it. Even so, it was very well-rounded and well-balanced, improving as it cooled, its complexity and a little sweetness emerging. I paired the split-shot with a slice of Pistachio, Lemon, Hazelnut and Courgette cake, largely because I doubt I’ll get another chance! It was excellent: sweet icing, with pistachio pieces sprinkled on top, surmounting a cake (rather than a sponge) with a good, rich crumb. I also had a pesto, sun-blushed tomato, mature cheddar and spinach sandwich. Sometimes eating sandwiches can be a pedestrian experience, but this was anything but: packed full of flavour, the pesto giving it a real kick. This entry was posted in Cake, Coffee Shops, Coffee Terraces, Laptop Friendly, Norwich, Sandwiches by Brian Williams. Bookmark the permalink. Some more thoughts for Norwich: The Window on Wensum St consistently gets good reviews, and is extremely cute but *very* small. I preferred the coffee at Kofra tbh, serving up some of Belgium’s finest from Caffenation. I also saw (but was done for the day) potential at Dandy Horse Bikes & Coffee…ymmv. Plenty of reasons for me to go back then! Hayley, the owner of the Window is a really nice Girl. Others to try while you are there is the Little Red Roaster (they have a stall on Norwich Market & Two shops) And Smokey Barn Roasters.